Climate Communication | Do climate scientists agree that the world is warming and that humans are the cause? Home | What	`s New | Common Climate Questions | Do climate scientists agree that the world is warming and that humans are the cause? Q: Do climate scientists agree that the world is warming and that humans are the cause? 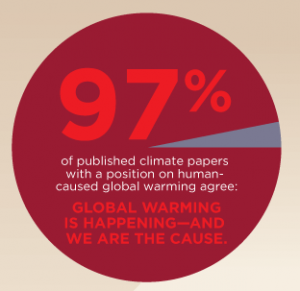 A: More than 97% of climate scientists have concluded that human caused global warming is happening. It is well established that human activity is the dominant cause of the warming experienced over the past 50 years. This conclusion is based on multiple lines of evidence, from basic physics to the patterns of climate change through the layers of the atmosphere. The warming of global climate and its causes are not matters of opinion, they are matters of scientific evidence, and that evidence is clear. These two basic conclusions, that the world is warming and that humanity is the primary cause, are well documented in the reports of the Nobel prize-winning Intergovernmental Panel on Climate Change. Further, these major conclusions have been objectively reviewed and independently verified by the National Academies of Sciences of all major countries including the U.S., and all relevant scientific organizations such as the American Geophysical Union, American Meteorological Society, American Association for the Advancement of Science, and the Royal Society of the United Kingdom.